food, culture and life from home and afar. 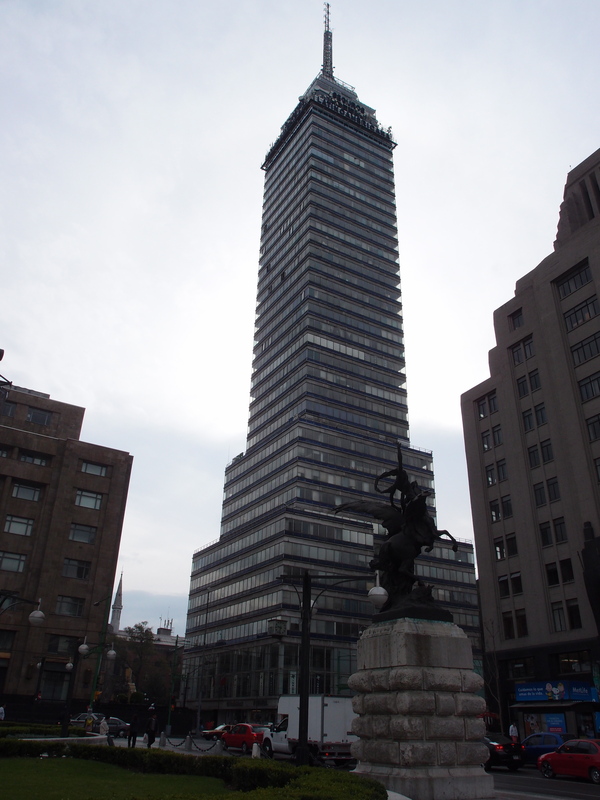 The many social and artistic layers of Ciudad de Mexico. The smog haunts the city like Monet’s Londres, le Parlement. Trouée de soleil dans le brouillard and the sounds of impatient horns eco between the Aztec, Teotihuacan and Colonial infrastructures that make up Ciudad de Mexico. 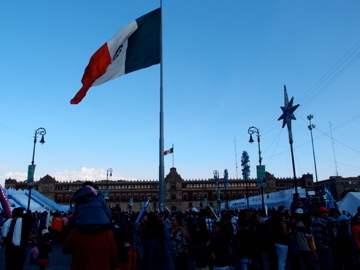 Officially a federal entity with its own jurisdiction from Mexico, the eighth largest city in the world has played its own part in the goliath of globalisation throughout the twentieth century. Through structure and innovation, Mexico City is vastly becoming the epicentre of Spanish culture, life, crime and style. Considered the largest Spanish-speaking city in the world, it pays to learn the language. Unlike many other non-English speaking corners of the globe, English is far from local’s ears and to deter from complete and utter confusion (and ignorance), an hola, por favor and Muchas gracias never goes astray. Latin Americans are very proud of their language and proud too of the rich political history, which is easily accessible throughout the abundance of historical outlets and memorials scattered around the city. 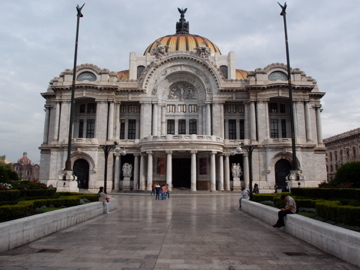 Between the charm of the shantytowns and climbing crime rate lays a wonder of architecture such as the Museo del palacio de bellas artes, which is filled, with the many murals of Mexico’s political art catalyst himself, Diego Riviera and is situated in the heart of Centro Historico. Riviera’s fresco works caused controversy both locally and abroad whereby he established a very strong rebellion through art during the social realism period of the 30s and 40s. 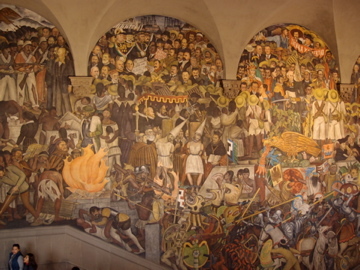 Riviera’s most famous work depicting the events of Mexican history, including the Spanish Inquisition, Mexico’s relationship to the USA and Diego’s strong connection to Communism is also situated in the Centro Historico on the centre staircase of the National Palace. Where history meets present, the modern preservation of Frida Kahlo’s “blue house” and studio in the Colonia del Carmen- a rather wealthy hub on the outskirts of the city – demonstrates the rich and vibrant society of Mexico City and its cosmopolitan counterparts. Surrounded by large homes and green sidewalks, Carmen proves to be an escape for many from the bustling components of the city. At the time of her death, Frida’s wishes were upheld and the preservation of her life, paintings, gifts and jewels were opened to the public after being respectfully kept hidden away for four years. Oddly enough, the kitchen of all places in Kahlo and Riviera’s blue home is the most interesting of rooms with an array of sculptures from her parents years in the home, a traditional wood fire oven and Kahlo’s own collection of assorted kitchenware. 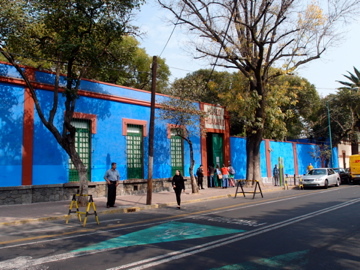 The ‘Blue house’ that Frida Kahlo and Diego Riviera lived and worked in throughout their marriage. For a city with so much to do, nothing moves at a fast pace, except perhaps for eating. Mexican’s rarely stop long for a meal and rather chose to eat street side, clutching to their tacos and tostadas as they stroll between the crowded streets to their next destination. Ingredients are a basic six but pack a punch creating tiny little explosions with every bite. Much of the food is of snack proportion so much is required to feel satisfied, but at merely no more than $1 for six tacos, it is easy to say yes to more…and more. Food, at times, is exceptionally difficult to find – especially without the language – therefore taking advantage of the lunchtime tostadas stalls is a high recommendation. 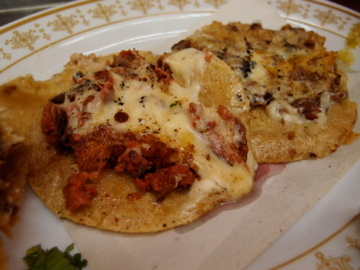 A sample of street food tacos. Mexico City is one of amazing cultural developments rapidly advancing through the modernisations of a considerably historical, old-fashioned city. The merge of old and new is fascinating as the inhabitants contemplate the seriousness of replacing culturally ancient, war torn infrastructure with the modern marvels of gaudy American high-rises on a Mexican building schedule. The Centro Historico is riddled with a mix of architectural periods and the empty shells of abandoned hazards. As more flock to the city for work and money, land space decreases, the buildings scrape higher and green grass is absorbed. Hopefully what does not get absorbed in the next few years to come, is the street life, beautiful architecture and the relaxed natures of the locals. ← The year of the snake. Hi my friend! I want to say that this article is amazing, great written and come with approximately all vital infos. Iˇ¦d like to peer extra posts like this . Great goods from you, man. I have understand your stuff previous to and you are just too excellent. I actually like what you have acquired here, certainly like what you are stating and the way in which you say it. You make it enjoyable and you still care for to keep it sensible. I can not wait to read much more from you. This is actually a great website. Nominee for AWC best blogs 2014.